During his speech at the University of Iowa Field House on April 25, Obama focused on the importance of freezing student loan interest rates, but he also emphasized the important role of individual schools in keeping higher education affordable. “We’ve got to stop subsidizing skyrocketing tuition, or we’ll run out of money,” he said. He added that his administration has “put colleges on notice.” If they can’t keep tuition down, federal funding will go down. 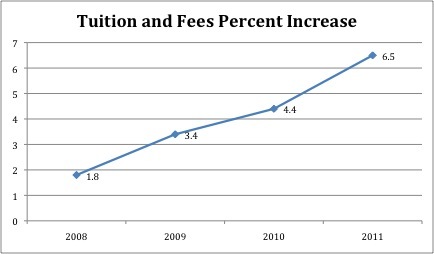 During fiscal year 2011, tuition and fees increase was 6.5 percent for Iowa universities. However, the national increase was 8.3 percent, according to the College Board. Despite the relatively lower tuition increase, students in Iowa have a high level of debt in comparison to other states. According to the Project on Student Debt, the average debt for seniors graduating in 2010 was $29,598, which ranks third in the nation. The national average is about $25,250. Iowa’s higher student debt could be due to the fact that a broader range of the economic population attends Iowa universities, According to Charles Whiteman, a University of Iowa professor and the director of the Economic Research Institute. A 2010 report by the Iowa Board of Regents, noted that the media household income and median family income is lower in Iowa than at the national level. In 2006, the median household income was the second lowest among Iowa’s eleven peer states, according to the report. In 2011, about 61 percent of University of Iowa graduates were burdened by a debt that averaged $25,400, while 39 percent graduated without debt, said Mark Warner, the assistant provost for enrollment management and the director of student financial aid. However, the two-year study of recent University of Iowa graduates shows that the cohort default rate was 1.9 percent, Warner said. The default rate divides the number of borrowers who defaulted by the total number of borrowers in the group. In the 2010-2011 school year, 11,236 University of Iowa undergraduate students received loans. This represents about 53 percent of undergraduate students, Warner said in an email. In total, University of Iowa students took out about $32 million in loans, with an average loan of about $4,000 per student, he said. With student Stafford loan interest rates on the verge of doubling, President Barack Obama entered the University of Iowa’s Field House today and urged students to appeal to Congress to extend the rate freeze before it jumps to 6.8 percent in July.